Based on Anna Gavalda's 2004 novel, Hunting and Gathering (a.k.a. 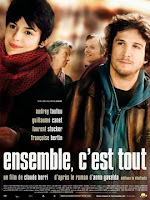 Ensemble, c'est tout) is a romantic comedy set in Paris. Audrey Tautou plays Camille Fauque, an anorexic office cleaner (a.k.a surface engineer), who dabbles in sketches during her free time, much to her Mom's dismay. She lives alone in a shoe-box of an apartment. One day, she meets her stuttering neighbor Philibert Marquet de la Tubelière (played by Laurent Stocker). He sells postcards for a living and aspires to be a theatre actor. Sharing the opulent apartment left behind by his grandmother is Franck (Guillaume Canet), a womanizing chef, who grows weary of taking care of his elderly granny Paulette (Francoise Bertin). Over the course of a year, the movie tracks how the main protagonists come together and draw inspiration and support from each other. GF was asking me what's the meaning of the movie title. I don't know the answer, but I told her that's a very good question. :-) At Westfield Hurstville, we had snacks at McDonald's and Japan Crepes. Back at home, I upgraded our old 1st Edition TomTom One to the latest software. The latest version of TomTom Home can't recognize our device, so I had to download and install an older version. Once TT Home is able to see our TT One, it proceeded to download the latest V7 firmware and install it. By using a patched ttsystem file, the TT One is now able to make use of the latest Australian maps. Easy as that.